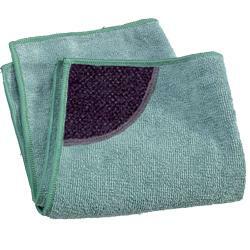 $7.50 Save time and money with this long-lasting, soft but thick, absorbent cleaning cloth. Use on all kitchen surfaces including stainless steel, tiles and painted surfaces. It holds grease, grime and bacteria which other cloths leave behind. A safe, non-toxic alternative. You just need water - no other cleaning products or paper towels. One corner of the cloth is a scrubbing pocket for hard to remove grease and dirt. Good for 300 machine washes.